RUFF: A Lost Dog Tale begins with an entertaining and fast-paced fable of two dogs, with entirely different backgrounds and temperaments, stranded on a desert island in the middle of nowhere where everything is PURPLE! In the course of their efforts to survive, they learn how to work together in a totally unfamiliar environment to get off the island. The second part of the book is a hands-on workbook, the Get-Going Guide that identifies 5 Great Strategies used by the charming canines and real people to move forward through change. A fun read, this book helps people to face change at work or at home with a positive, strategic perspective. 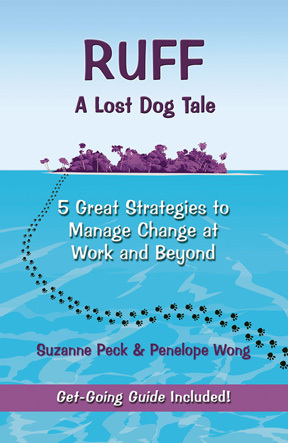 Authors Suzanne Peck and Penelope Wong bring extensive experience in managing change. Peck consults, teaches, designs and leads educational programs for culturally diverse workforces nationally and internationally.Wong creates powerful branding and award-winning advertising for leading companies. Peck and Wong are sought-after speakers, trainers and writers. RUFF is a wonderful resource to help facilitate our successful navigation through an increasingly complex and challenging environment. A cheerful, quick read. The tale reminded me of Maurice Sendak's writing, while the workshop portion is clear and well presented-tackling core workplace issues of alignment, difference, power, collaboration, courage and teamwork. Whether you are a large company dealing with the effects of globalization and an increasingly diverse workforce or an individual who needs to reinvent yourself, this book will speak to you. RUFF shows how to face change with a positive, strategic perspective. 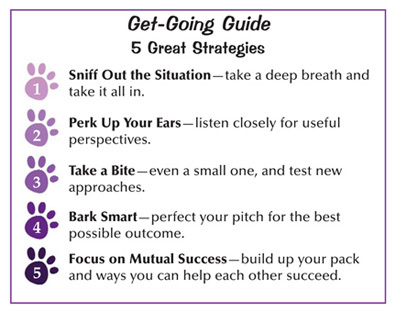 It uses the charm of dogs to take the bite out of a tough topic and identifies 5 Great Strategies to move forward through change. Blue Point Books offers volume discounts and more. For information, call us toll-free at 800-858-1058 or email us at bpbooks@west.net.